Many years ago, Elizabeth and I took our kids for an outing in the Brindabella bushland west of Canberra. It was hot and, as they were only little tackers, they took it in turns to ride on my shoulders. I was much younger and fitter in those days but, nevertheless, playing the beast of burden in the midday heat soon had me gasping. The kids, meanwhile, were enjoying themselves immensely; so much so that, while the littlie was taking her turn to ride, she suddenly declared, “Bushwalking’s great fun”. And so it is – a fact recognised by many travellers and the national parks staff who maintain thousands of kilometres of walking tracks for our enjoyment. Over the years, we have tramped over many trails, with and without the kids, in scores of national parks across the country. It’s difficult to choose the best from among our many favourites – they are all special in their own unique way – but here are some standouts that are guaranteed to satisfy the Paddy Pallin in everyone. The loop is a combination of several walking trails traversing 8km of gorges and gullies in the traditional lands of the Malyankapa and Pandjikali people north-east of Broken Hill. It begins at the Homestead Creek camping ground with a pleasant walk along the (usually dry) watercourse lined with river red gums, then joins the Thaaklatjika Mingkana walking track that meanders through a red sandstone gorge to Wrights Cave (Thaaklatjika). This rocky overhang features an array of Aboriginal paintings, stencils and engravings. About 2km further on, the Rockholes Loop track diverts on a short, steep climb to a rocky outcrop with splendid views over the gorge and the Byngnano Range beyond. Nimble-footed walkers on this trail may be lucky enough to encounter shy yellow-footed rock wallabies that reside among the rock pools. Back in Homestead Gorge, the track continues along the creek between narrowing sandstone cliffs and terminates at a large, mirror-still waterhole edged in gums and black cypress pines. This serene oasis is a birdwatcher’s paradise, teeming with colourful budgerigars, zebra finches and corellas. Retracing the trail for a short distance leads to the junction of the range walk proper, which climbs steeply through rain-carved gutters to the plateau – a breathtaking landscape of bare ochre rock relieved only by scattered clumps of twisted mulga. The trail undulates across this stark terrain before descending through a series of tight chasms to a rock-strewn watercourse for the return leg to the camp. Wilsons Promontory (aka ‘the Prom’) is the southernmost point of the Australian mainland. Tidal River, 30km inside the park boundary, is the focus for tourism and recreation, with numerous walking trails fanning out from here through temperate rainforests and coastal wilderness to towering granite mountains and sugar-white beaches. One of the best day walks begins at the carpark opposite the visitor centre and meanders on a 1km boardwalk (the Loo-Errn Track) over pristine wetlands to the south bank of Tidal River. 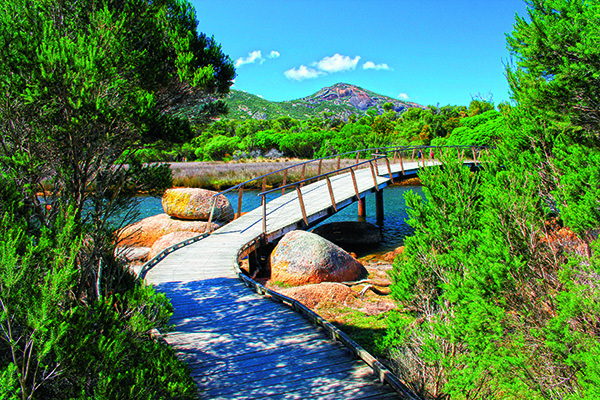 Crossing a footbridge, with platforms allowing access for fishing, a trail climbs to Tidal Overlook, the highest point between Norman and Leonard Bays, with panoramic views across the riverine wetlands to Mount Oberon. The trail soon intersects a circuit that encompasses Pillar Point. Turning right leads to an outcrop of granite boulders with splendid views toward the rocky summit of Mount Bishop. Continuing on the circuit track through banksia heath and wildflowers takes walkers out along the ridge to Pillar Point, a headland with breathtaking views of Norman Beach and Mount Oberon to the south and Leonard Bay to the north. From the headland, walkers can either continue the loop back to Tidal River or pick up the Squeaky Beach Track for a moderate 2km (one way) descent through bushland to Leonard Bay. Either way, a refreshing swim awaits you at a magnificent surf beach. 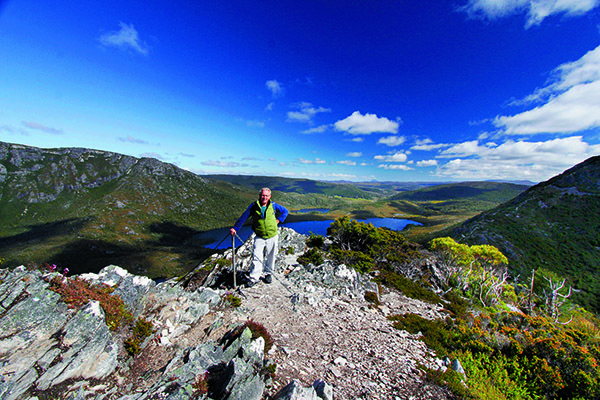 Cradle Mountain is the starting point of the iconic, multi-day Overland Track, but the majority of visitors come to Dove Lake on a day pass, looking to step out on one (or more) of the many excellent walks in the area. 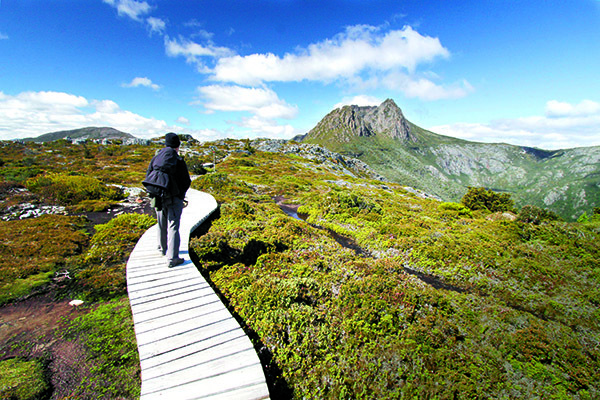 The most popular is the Dove Lake Loop Track, a 6km (Grade 2) circuit that takes about two hours. But for those looking for a more challenging excursion, the Dove Lake High Circuit is highly recommended. This Grade 4 hike begins at the lakeside carpark and follows the Dove Lake Loop along the eastern shore to Glacier Rock, the top of which affords an excellent view across the lake to Cradle Mountain. Further on, it connects with the Lake Rodway Track, where chains have been installed in rough gullies to assist the steep ascent towards Hanson’s Peak (1185m). At the top, the track continues south across an exposed granite saddle with spectacular panoramic views. Just beyond Lake Hanson and the Twisted Lakes is a junction where the Face Track diverts steeply towards Little Horn (1355m), then skirts beneath the dolerite ramparts of Weindorfers Tower and Smithies Peak. Part way along this section, the Lake Wilks Track descends the mountain (using more chains) past an alpine tarn to re-join the Dove Lake Loop and return via the primeval Ballroom Forest and the boat shed back to the carpark. According to my Fitbit, this is about 10km, 15,000 steps and 161 floors – and a fantastic way to see one of the best-known natural wonders in the Tasmanian Wilderness World Heritage Area. 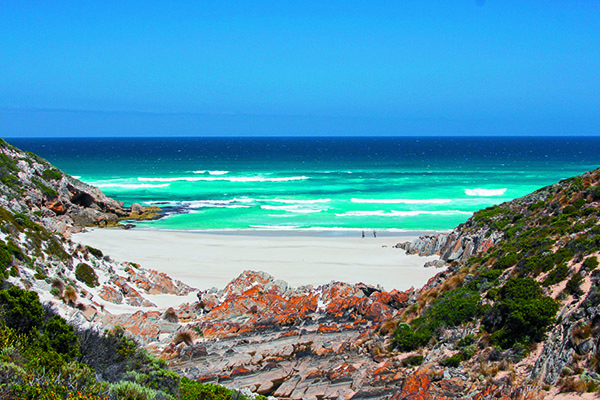 This rugged wilderness is at the western extremity of Kangaroo Island. As well as iconic features like Admirals Arch and the aptly named Remarkable Rocks, the park contains a network of walking trails, including the 4.2km (return) Snake Lagoon hike. This popular ‘Great South Australian Short Walk’ is of moderate difficulty and begins at the secluded Snake Lagoon campground. The trail is a flat and sandy path for the first kilometre as it traces a ridgeline through woodland of mallee and sugar gum. This is a great opportunity to observe some of the abundant wildlife, including tammar wallabies, Rosenberg’s goannas, short-beaked echidnas, scarlet robins and golden whistlers. Gradually, the track descends into Rocky River Valley and crosses the watercourse on a footbridge, which may be submerged when the river is swollen by winter rains. In the arid heat of summer, the river can shrink to a chain of isolated billabongs above the crossing, while below it the valley floor is exposed to reveal a corridor of bare serrated ridges and folds of rock. For the next kilometre, the trail meanders beside rock formations in the riverbed that become increasingly dramatic as it approaches the mouth. Near the end, the river cascades (seasonally) over a jagged waterfall before tumbling the last few hundred metres onto a snowy-white sand beach. At the shore of this clandestine cove, the surf rolls in off a turquoise Southern Ocean to complete a scene of coastal splendour. 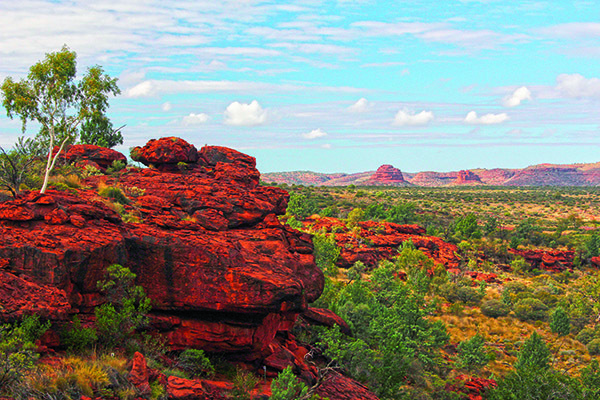 Just west of Alice Springs is one of central Australia’s premier wilderness reserves. The river that lends its name to the park has, for thousands of years, formed a vital drought refuge for the Western Arrernte people. 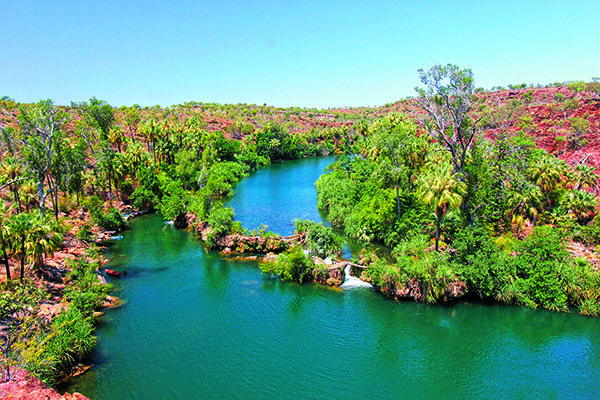 Within the park, it has carved a gorge in the arid landscape to create Palm Valley, named for the lofty red cabbage palms that grow here in Edenic profusion. The valley can only be reached by 4WD vehicles on a rough track that occasionally plunges into perennial pools and channels. Once through, you can explore on foot by two walking trails – the Arankaia Walk (2km) and the Mpulungkinya Walk (5km) – which are easily combined. From the carpark, the Arankaia trail scales sandstone slabs interspersed with spinifex and native figs. At the top, the track meanders along the rim of the canyon between Namatjira-like ghost gums, revealing spectacular views along the valley. After a short distance, the Mpulungkinya Walk branches away across the plateau, weaving between mulga brush and acacia over the rusty-red sandstone, until it reaches the edge of an escarpment with a panoramic vista over ‘Palm Paddock’. From here, the trail descends steeply through boulders and cypress pines to the valley floor, which loops back to the east. Along the way, the trail skirts lush palm groves, jumbles of huge boulders and limpid pools, which sometimes span the gorge to be waded barefoot. Passing the western end of the Arankaia track, walkers can climb man-made stairs to the valley’s rim or continue along the river to complete one of the best remote bushwalking experiences in the country. 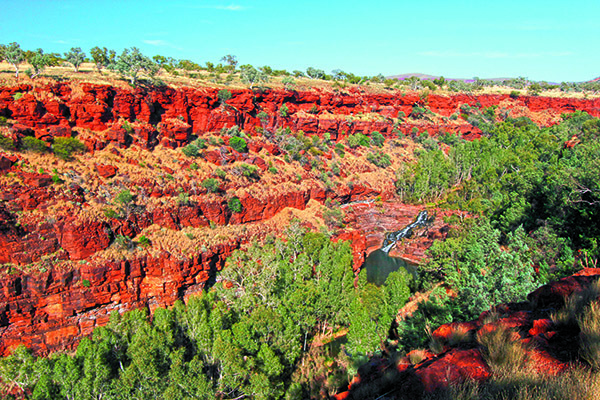 Karijini, in the heart of the Pilbara’s Hamersley Range, is popular among wilderness adventurers for its sheer-sided chasms and perennial streams that carve through an ancient savannah landscape. One of the best ways to explore it is on the scenic 7km (return) Dales Gorge walk. Beginning at the camping area near the gorge, the trail follows a red gravel track lined with brilliant-white snappy gums to a platform with a breathtaking view into Circular Pool 30m below and the red, terraced walls of Dales Gorge to the west. From here, the track snakes along the rim above the cliffs, between gnarled gums, golden-budded acacia shrubs and waist-high spinifex. After about a kilometre, Fortescue Falls appears, cascading over an amphitheatre of narrowly terraced strata to a cool pool, and the track descends by a staircase sculpted in the sandstone scree. Above the falls, a paperbark-lined creek retreats to its source at Fern Pool, reached by a 300m track through a grove of ancient figs and ghostly white gums. This site has special significance for local Aboriginal people, as the sleeping place of the legendary Water Serpent. Below the falls, the trail criss-crosses the creek back along the gorge, fording the deeper pools by stepping-stones or narrow ledges jutting from the base of the cliff face. Skirting a chaotic jumble of jagged sandstone slabs, the trail enters a long avenue of tiered platforms to Circular Pool, where the sometime-waterfall trickles down the face of a concave grotto into a chilly turquoise pool. This is a good place to rest and refresh before resuming the trail that ascends the not-quite-sheer side of the gorge by a staircase of rocky steps, emerging on the rim close to the lookout where the trek began. This is one of the most beautiful and pristine places in all of outback Queensland. The centrepiece is Lawn Hill Gorge, a series of sheer, flame-red sandstone cliffs that tower up to 60m above the opalescent Lawn Hill Creek. The park’s varied and unforgettable landscapes may be explored by some 20km of walking tracks in differing lengths and degrees of difficulty. The most challenging of these is the walk to the Upper Gorge Lookout, which is 7km (return) but may be extended to almost 10km by including cross tracks to Indarri Falls and Middle Gorge. From the carpark at the visitor hub, the trail strikes out west along the Indarri Falls Walk through an open woodland of ghost gums and wattles before climbing steeply over an escarpment to a lookout above the falls. Plunging abruptly into the gorge, the trail again veers west and follows the banks of the creek through a lush riverine forest of pandanus, figs, cabbage palms and paperbarks. After about a kilometre, the track leaves the creek to skirt around some cliffs then rises sharply to a ridge that ends at the lookout overlooking Upper Gorge. The view here is absolutely spectacular and well worth the climb. From the lookout, the trail descends the ridge on a gentler sloping route that loops back east and links first with a track that crosses the plateau to Middle Gorge or, further on, back to Indarri Falls Lookout. Both of these join the trail along the scenic rim of Middle Gorge to Duwadarri Lookout, with outstanding views over Lawn Hill Creek, before a short, sharp descent to the camping area and carpark.